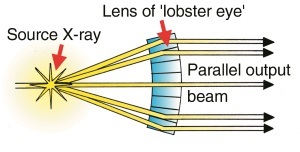 Diagram showing how the lobster eye focuses light. Adapted from Denton.5 Click for larger view. 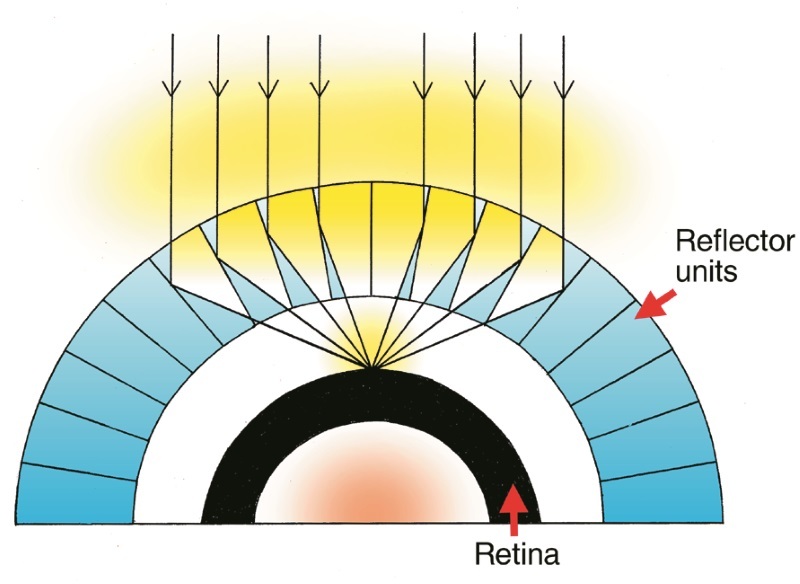 This is needed, because the eye focuses light by reflection, unlike most other eyes that focus by refraction (bending of light) by a lens. The graph paper appearance is caused by the ends of many tiny square tubes on a spherical surface. 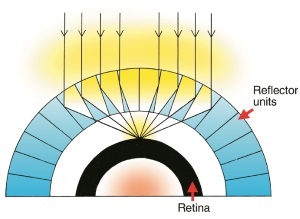 The sides of the tubes are very flat and shiny mirrors, and their precise geometrical arrangement means that parallel light rays are all reflected to a focus3,4 (see diagram). Not only does the lobster eye have all the earmarks of being designed by a master designer, it has also inspired human designers. Astronomers had wanted a telescope that could focus X-rays from certain heavenly bodies, but there was no practical lens that would focus X-rays. An ordinary concave mirror wouldn’t work, because X-rays would just go through—they reflect only at glancing angles. But Roger Angel of the University of Arizona pointed out that this problem ‘might be overcome by copying the design of crustacean eyes.’6,7 The Lobster Eye, launched by a satellite, should enable astronomers ‘to observe a quarter of the sky at any one time’.6 An elaborate process produces a 5 by 5 cm (2 by 2 inches) array of tiny (10–200 microns (µm)8 across) square, hollow tubes made of X-ray-reflecting lead glass, about 0.5–1.0 mm deep, then heated and curved into part of a sphere, just like the lobster eye. A hundred of these would be grouped into modules, and 20 modules fitted to the telescope. 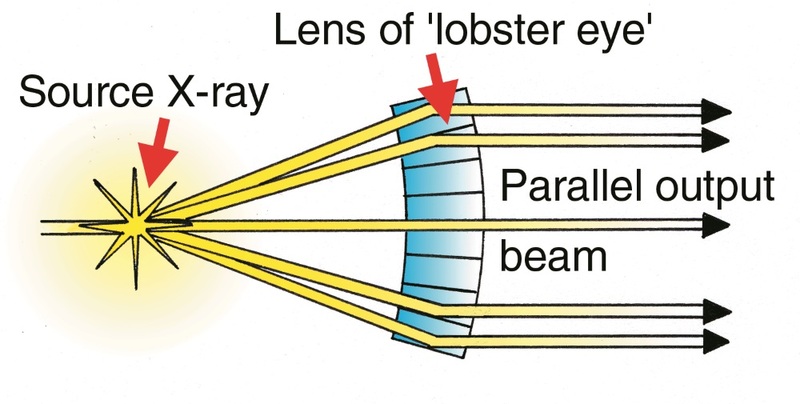 Diagram showing how a lobster eye lens working in reverse generates a parallel X-ray beam. Adapted from Chown9 Click for larger view. The lobster eye design could also help in making computer chips with electronic components hundreds of times smaller than is possible today. Chips are made with photolithography, where a beam of parallel light shines through a stencil-like mask onto a semiconducting material, and changes it so that acid will not etch the part exposed. Then acid etches the rest away, leaving the desired pattern. However, there is a limit to how small the pattern can be, because light bends around edges (diffraction), thus spoiling the pattern. Shorter wavelengths mean less diffraction, and use of ultraviolet light has resulted in components only 0.18 µm across. X-rays would be ideal because of their tiny wavelength, but it has been expensive to produce a parallel beam. Lobster eyes: chance or design? A pathway of many tiny steps, with each new change caused by genetic copying mistakes (mutations). Each step must have an advantage over the previous one, so its possessor will leave more offspring (natural selection). The lobster eye exhibits amazing design, and has even inspired human designers to copy it for advanced technological applications. This eye, like many other features in living organisms, defies all plausible attempts to explain it without a Designer. 10-legged crustaceans are called decapods, and these particular ones are of the suborder Macrura—see Ref. 4. Return to text. Hartline, B.K., Lobster-eye x-ray telescope envisioned, Science 207(4426):47, 4 January 1980. Return to text. Land, M.F., Superposition images are formed by reflection in the eyes of some oceanic decapod crustacea, Nature 263:764–765, 1976. Return to text. Land, M.F., Animal eyes with mirror optics, Scientific American 239(6):88–99, December 1978. Return to text. Denton, M.J., Nature’s Destiny: How the laws of biology reveal purpose in the universe, ch. 15, The Free Press, New York/London, 1998. Return to text. Chown, M., I spy with my lobster eye, New Scientist 150(2025):20, 13 April 1996. Return to text. See also Angel, J.R.P., Lobster eyes as X-ray telescopes, Astrophysical Journal 233:364–373, 1979; and Hartline, Ref. 2. Return to text. 1 µm (micron) = 10–6 m, so 1,000 µm = 1 mm = 1/25 inch. Return to text. Chown, M., X-ray lens brings finer chips into focus, New Scientist 151(2037):18, 6 July 1996. Return to text. Sarfati, J.D., Refuting Evolution, ch. 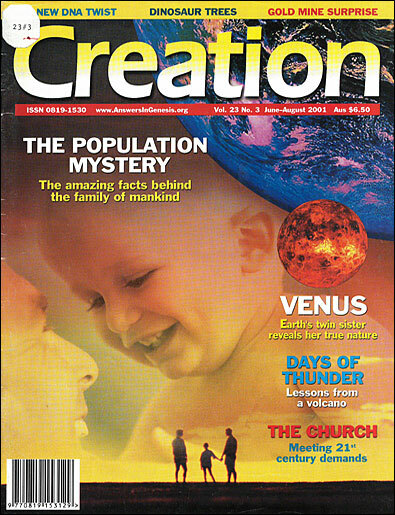 1, Creation Ministries International (Australia), 1999. Return to text. Grigg, R., Ernst Haeckel: Evangelist for evolution and apostle of deceit, Creation 18(2):33–36, 1996. Return to text. A term coined by biochemist Dr Michael Behe, Darwin’s Black Box: The Biochemical Challenge to Evolution, The Free Press, New York, 1996. Return to text. Biophyicist Dr Lee Spetner shows mathematically that such weak natural selection could not be responsible for generation of new information, because it would be swamped by chance—see Not By Chance: Shattering the modern theory of evolution, The Judaica Press, Brooklyn, New York, 1997. Return to text.